JAG's seats come with an easy remove "snap" on the slow close hinges that allow you to easily remove and re-install the toilet seat for easy cleaning. 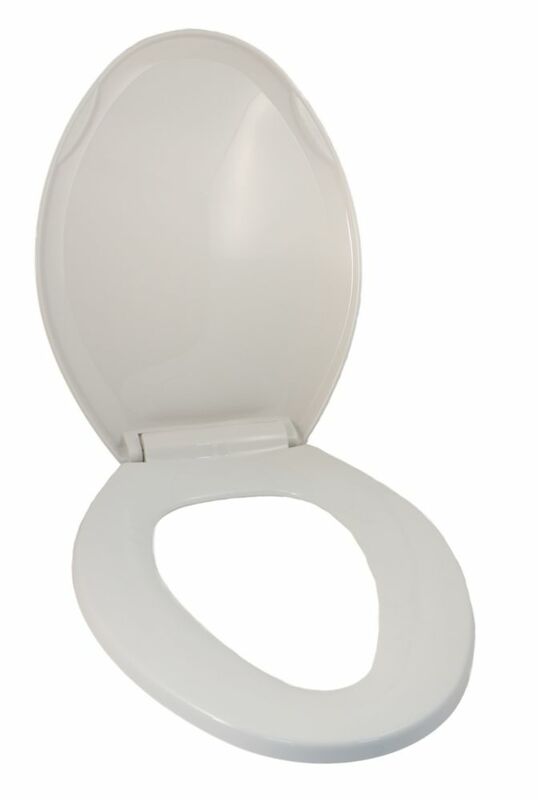 Universal Elongated Bowl Toilet Seat in White with Slow Close Hinges is rated 4.5 out of 5 by 8. Rated 5 out of 5 by PnnyPnchr from Great price, good quality I bought this last month and we are very happy with it. It fits well, closes slowly, and doesn't wobble. I used a rubber cone washer I had to secure it better. I initially had some trouble prying open the "easy-off" clips but JAG customer service took excellent care of me. Rated 5 out of 5 by Susan from Good quality! We are very pleased with the purchase of our new toilet seat. It was easy to install and is easy to remove for cleaning. It was delivered very quickly. Rated 2 out of 5 by anne from doesn’t fit well Bought this a few weeks ago. It has a good review and I like that it has a slow close cover and easy to remove for cleaning. But a big let down is that it wasnt stable on the toilet lid once attached, it doesnt sit well. It moves no matter how i tighten up the screw and is SO ANNOYING. I weigh 130lbs and I assume if you’re heavier you’ll even be more annoyed. So if you want better fitting toilet sit cover, don’t buy this. Rated 5 out of 5 by Rajiv from Toilet seat I purchased toilet seat manufactured by Jag Plumbing and very happy with its quality and fitment to the toilet. Rated 5 out of 5 by Jake from Fits well on a long gated toilet I have send it a few months. It operates well, easy to Rembrandt for cleaning. Rated 4 out of 5 by Janice from Slow Closing Toilet Seat Love this type of toilet seat - no banging of the lid! Is a bit loose on the basin no matter how often we tighten it. Rated 5 out of 5 by MN739 from Quality product Very good quality, great price. Happy with the purchase. Rated 5 out of 5 by NCMY from Great Easy to install. Very quiet operation, and looks very good.